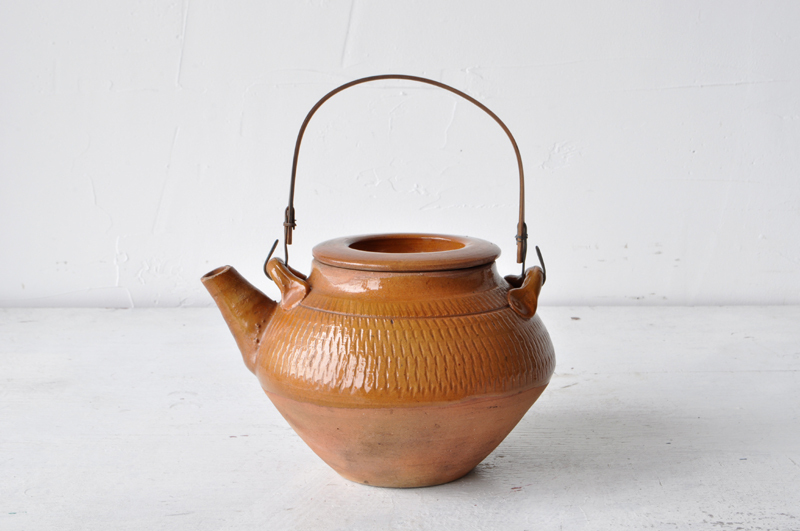 Mingei Kozai ware teapot (Dealer: hotoke) – Very mingei, and very scarce vintage Japanese pottery ware hardly seen today called Kozai ware in Kagawa prefecture. Showa period, 20th century. Refined Japanese-persimmon color and rhythmical pattern called ‘tobikanna’ (lit. ‘jumping iron’) by chatter marking technique using springy metal tool (called ‘tobikanna’). And, such well-matched elegant bamboo handle. In fine used condition as seen. No leak.